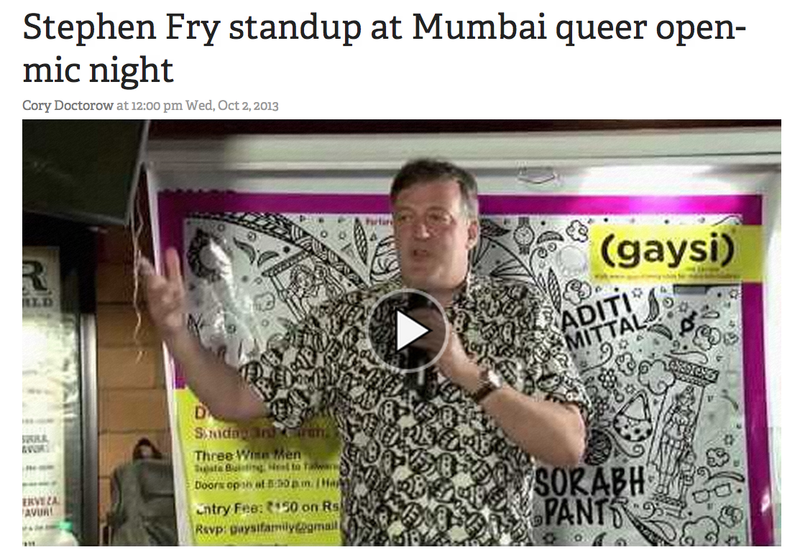 Early this year, Gaysi Family had a fantastic coup – The BBC and Stephen Fry and Dirty Talk all in one at The Three Wise Men in Mumbai on Sunday, March 3rd, 2013. Guess which awesome blog just picked up on that fantastic event and featured us? Early this year, Gaysi Family had a fantastic coup – The BBC and Stephen Fry and Dirty Talk all in one at The Three Wise Men in Mumbai on Sunday, March 3rd, 2013. Guess which awesome blog just picked up on that fantastic event and featured us? Boing Boing! That’s right, by none other than Cory Doctorow! Needless to say, we at Gaysi are all terribly excited to become part of the ‘weird, wonderful and wicked things to be found in technology and culture’ showcased by Boing Boing. And…We just had to let our amazing readers know that we are getting our Queer Word out there – in the mainstream, in the alternative – everywhere, so stick around for the ride! Click through to read more over at Boing Boing!